NantHealth (NASDAQ: NH), a leader in connected care solutions, and Baxter International Inc. (NYSE:BAX), a global medical products company, today announced that a NantHealth digital health solution is now available to connect Baxter’s Prismaflex system to a hospital electronic medical record (EMR). Prismaflex is used in the intensive care unit (ICU) to treat patients with acute kidney injury (AKI) and certain blood and autoimmune conditions, which can be life-threatening. The companies are demonstrating the technology at the 2019 Healthcare Information and Management Systems Society (HIMSS) Interoperability Showcase™ this week. ICU clinicians treat patients with the most serious and complex conditions. Care in the ICU is also multi-disciplinary, with several specialists and nurses providing care for these complex cases. 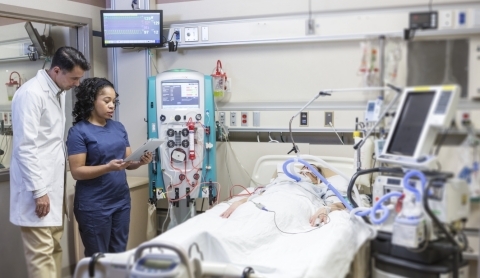 Despite these factors, technology and medical devices in the ICU remain largely disconnected and fragmented. These dynamics mean digital health solutions have the potential to positively impact patient care and hospital efficiency. NantHealth has built a device driver allowing integration of its DeviceConX platform with the Prismaflex system. NantHealth’s DeviceConX works with various electronic medical record (EMR) systems and enables straightforward integration of information from the device to the EMR. This means ICU nurses can spend less time manually documenting treatment data, while reducing the risk of transcription errors. NantHealth and Baxter are also working to validate drivers for Baxter’s next generation medical devices designed for the ICU. NantHealth will be showcasing Baxter’s recently integrated Prismaflex device in the HIMSS Interoperability Showcase in Hall F - Booth #9100, which brings together multiple vendors with kidney and dialysis treatment solutions. Prismaflex is Rx Only: For safe and proper use of the devices mentioned herein, refer to the complete instructions in the Operator's Manual. The Prismaflex system is intended for continuous renal replacement therapies (CVVHDF, CVVHD, CVVH, SCUF) and therapeutic plasma exchange (TPE). The Prismaflex system should be restricted to patients with a body weight greater than 20 kg (44 lb). NantHealth provides innovative solutions across the continuum of care for patients, physicians, payers and biopharmaceutical organizations. Connected Care, NantHealth’s Medical Device Interoperability (MDI) solution, provides hundreds of healthcare facilities across the globe with vendor-neutral device connectivity. Our combined hardware-software offering delivers high resolution, low-latency medical device data to a broad range of clinical systems, including EMRs and research databases. For more information, please visit https://www.nanthealth.com/. Every day, millions of patients and caregivers rely on Baxter’s leading portfolio of critical care, nutrition, renal, hospital and surgical products. For more than 85 years, we’ve been operating at the critical intersection where innovations that save and sustain lives meet the healthcare providers that make it happen. With products, technologies and therapies available in more than 100 countries, Baxter’s employees worldwide are now building upon the company’s rich heritage of medical breakthroughs to advance the next generation of transformative healthcare innovations. To learn more, visit baxter.com and follow us on Twitter, LinkedIn and Facebook. This release includes forward-looking statements concerning the EMR technology and Prismaflex system referred to in this release, including anticipated benefits associated with their use and anticipated production certifications, and a potential partnership between Baxter and NantHealth. The statements are based on assumptions about many important factors, including the following, which could cause actual results to differ materially from those in the forward-looking statements: satisfaction of regulatory and other requirements; actions of regulatory bodies and other governmental authorities; product quality, manufacturing or supply issues; patient safety issues; changes in law and regulations; breaches or failures of the company’s information technology systems or products, including by cyberattack, unauthorized access or theft; and other risks identified in Baxter's most recent filing on Form 10-K and other SEC filings, all of which are available on Baxter's website. Baxter does not undertake to update its forward-looking statements. Baxter and Prismaflex are registered trademarks of Baxter International Inc.
More news and information about Baxter International Inc.